Osprey is a magnificent manufacturer that offers the best camper’s gear. They’ve been providing the world with premium-quality backpacks ever since 1974, and are currently one of the best manufacturers in this line of work. Mike Pfotenhauer is the founder of Osprey, and he’s “responsible” for such quality – he participates in the manufacturing process of most Osprey backpacks, and it’s very interesting to know that he started out alone. Mike made his very first backpacks in California, just as he finished college, and made history when he introduced Osprey to the world. 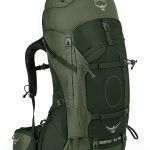 Osprey’s Backpacks are considered to be the best as they provide superior comfort, they’re practically weightless, and they look absolutely majestic. The “AG” right next to “Aether” stands for Anti Gravity™ suspension that’s one of the vital features of every Osprey Aether backpack. 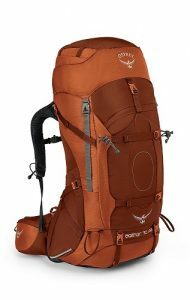 Now, this series is comprised of three backpacks – Osprey’s Aether AG 60, Osprey’s Aether AG 70, and Osprey’s Aether AG 85. The only bad thing about this series is the “male only” gender specifics. These backpacks simply aren’t made for women, mainly because they’re very big. Even though Osprey’s Aether AG backpacks offer superior comfort, they still might be too hard for women’s back. Apart from that, these backpacks come with a variety of features, including the integrated raincover, the custom moldable hipbelt, the torso adjustability, the trekking pole holding compartment, a manifold of pockets, and such. Each backpack also comes in three different colors. Since there’s a massive hype about the Osprey’s Aether AG 70, we have to cover pretty much everything. The hikers and campers simply adore this backpack, as it’s very comfortable to wear. Furthermore, we’ll talk about the design of Osprey’s Aether AG 70. This is one of the most beautiful Osprey backpacks, and we’ll show you why. We will also talk about the manifold of features Osprey Aether AG 70 comes supplied with. This backpack offers a lot, but it’s not perfect – this is the reason why we’ll close our review with the Good & Bad about Osprey’s Aether AG 70 and the value section. This backpack excels in the field of aesthetics. It’s one of the most beautiful camping backpacks on the market, and it’s safe to say that most people will find it attractive. It’s quite large, and it comes equipped with many bracers, pockets, and straps. Furthermore, this backpack is adorned with a majestic eagle on top and bottom – the Osprey™ logo and the “Aether 70 AG” are printed as a sure sign of premium-quality. Outback Orange – This color variant is quite plain and straightforward. It’s minimalist, yet beautiful. If you like camping trips during autumn, this is your best bet. Neptune Blue – The Neptune Blue is very hard to describe with words. The shade of blue implemented in the design of this color variation is so clear and appealing that you will refrain from ever putting this backpack off your back, lest it gets dirtied. Adirondack Green – This color variation of Osprey’s Aether AG 70 is, perhaps, the most puzzling. It’s both camouflaging and beautiful. The Adirondack green should be your first choice if you’re a fan of the great wilderness. Small note – each name of the color variations was taken directly from the Osprey™ official website. Gear Capacity in Cubic Inches – 4.089 Cu. In. Gear Capacity in Cubic Inches – 4.272 Cu. In. Gear Capacity in Cubic Inches – 4.455 Cu. In. Gear Capacity in Cubic Inches – 4.638 Cu. In. The Overall Rating of Osprey Aether AG 70 Style and Design gets 4 out of 5 stars. This backpack is remarkably beautiful, stunning, and appealing, but it only comes in three color variants. Most of Osprey’s backpacks come in a variety of colors, and this is the only reason why Aether AG 70 isn’t perfect in terms of style & design. A backpack such as AG 70 is specifically designed to withstand harsh weather, cuts, scrapes, wind, and such. Osprey Aether AG 70 is made of Ripstop nylon and nylon oxford materials which provide superior durability without lowering the overall comfort rating. The frame material is the HDPE framesheet and a single metal alloy peripheral frame. These materials are considered to be among the most durable materials used in the backpack construction. A special kind of foam was inserted in the harness so that it keeps moisture away during the warm and hot seasons. This dual-density foam also promotes airflow, increasing the overall comfortability as well as durability. The last thing we need to discuss is the “All Mighty Guarantee”. This guarantee is literally the best assurance that your Osprey Aether AG 70 will remain durable for years to come. This guarantee, however, doesn’t cover the cases of accidental damage, wear, tear, or abuse – rather it will grant you a replacement (or a total refund) if Osprey AG Aether 70 had defects or errors in construction. 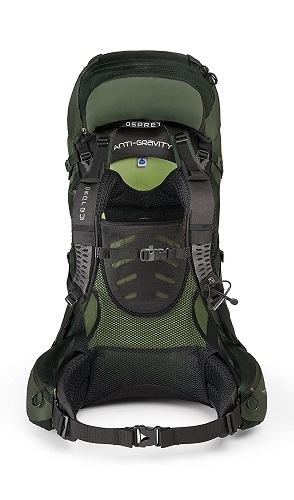 The Overall Durability Rating of Osprey’s AG 70 gets 5 out of 5 stars. This backpack is extremely durable, and it will be able to survive years and years of usage. Furthermore, the All Mighty Guarantee assures you that your backpack will be fully functional at the time when you receive it. This is definitely one of the sturdiest backpacks on the market. Aether AG 70 is made from such materials that it’s extremely comfortable to wear it. The Custom Molding is optional, but it greatly improves the overall comfort rate, as it significantly softens the construction. The foam harness greatly increases the air flow through the material, resulting in a soft, cozy feel. The HDPE framesheet boosts the comfort rating in such a way that it protects the back of the wearer from pointy items. Osprey cares about its customers, and their target groups are campers, hikers, and people who enjoy outdoor hobbies. To best accommodate these groups of people, they’ve made Osprey Aether AG 70 – the pinnacle of comfort, reliability, and functionality. Not much can be said apart from the things we’ve already mentioned, as the comfort level of something as cozy as Aether AG 70 is hardly described with words. The Overall Comfort Rating of Osprey Aether AG 70 gets 5 out of 5 stars. You would have a hard time finding a backpack that feels as comfortable as this. With the ripstop nylon material construction, it’s both durable and comfortable. Furthermore, it’s incredibly spacious and durable, so it’s quite clear why Aether AG 70 deserved its five out of five points. Osprey’s AG 70 comes supplied with a lot of features. Actually, saying “a lot” is an understatement – these features are in such abundance that some people don’t get to try them all out. Apart from the obvious, there are state-of-the-art zippers and bracers, various straps and locks, a manifold of pockets, and more. You may think “why do I even need so many things?” and the answer would be quite simple. If you’re hiking or camping, you’ll have to carry a lot of things. These features help you carry your belongings in the easiest way possible. The overall features rating of the Osprey Aether AG 70 gets 5 out of 5 stars. Surely enough, there are a lot of features that come supplied to this magnificent backpack, and even though it seems like you won’t use them all, they’re very handy in most outdoor situations. 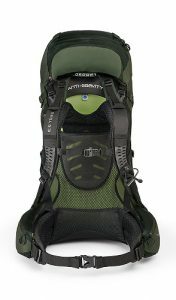 Plainly speaking, Osprey’s Aether AG 70 costs a lot. It’s not easily affordable by everyone, but that doesn’t mean that it’s not valuable for the cash. It’s quite on the contrary. Osprey’s Aether AG 70 belongs to the “expensive” price point category, and it’s definitely one of the best high-end camping backpacks that money can buy. Since this backpack is very, very durable, you can easily consider buying it as a longshot investment. You definitely won’t need another backpack in years, maybe even decades. As for the spaciousness, you can even take your bed with you on your trip (figuratively speaking). Even the smallest version of this backpack can hold up quite a lot of items. Needless to say, the larger variants can even accommodate a small child (if need be). 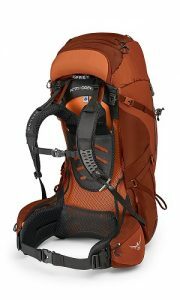 If this is not enough, just take a look at the manifold of features that come with this backpack. By now, you should have a clear picture of why Osprey’s Aether AG 70 is so valuable. Beautiful and attractive – Osprey’s AG 70 is extremely attractive. It comes in three different color variants, and it’s hard to say which is more beautiful. Let’s wrap it up – if you can get past the price, you’ll find Osprey’s Aether AG 70 perfect. It’s incredibly comfortable, it’s beautiful, and it’s very spacious and durable. The manifold of features will come in handy during all kinds of trips, and you’ll be thankful that those extra pockets were implemented in its design. The overall rating for the Osprey Aether AG 70 is 4 out of 5 stars purely for the fact that it’s pricey.